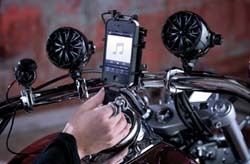 ...now you can listen to music on your Road King! 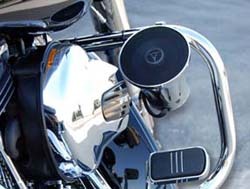 SH-200 to 600 Speaker Systems: Designed to be loud and clear even at highway speeds, the SH speakers can be paired with any compatible amplifier and are easily mounted to the handlebars or highway bars of your Harley-Davidson®, Honda, Yamaha, Victory and more. 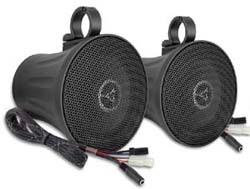 This is for a complete Motorcycle Speaker System kit. All you need to provide is your mobile audio device. 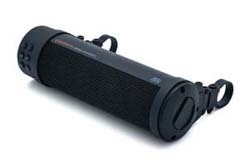 SB-14: Satin Silver Sound Bar, durable, weather-resistant and packed with plenty of power, the Sound Bar produces exceptional sound quality from the convenience of your handlebars. An internal amp powers two 2" x 3" full-range speakers and four high-frequency 1" tweeters to pump out crystal clear tunes to please the likes of any audiophile. Includes power, ground and ignition wire for easy disconnect, as well as auxiliary input for connecting devices via 3.5 mm cable. 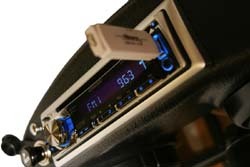 Internal Bluetooth receiver allows wireless connectivity to any Bluetooth-enabled smartphone or music device. Fits: 7/8" through 1-1/4" handlebars. Universal patent-pending mounting clamp that fits bars from 7/8" in diameter to 1-1/4"
SB-15: Similar to above but in Satin Black. CS-ULT: Tired of that wore out, broke down radio in your fairing, but don’t want to loose the factory audio steering controls? We’ve got your solution! 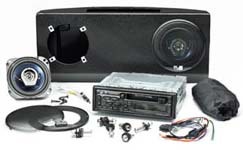 The Rock Box Audio Source Kit includes both the Rock Box wired for HD controller integration and the slick new HD Fairing Radio Din Bezel that is form fitted for the Rock Box. 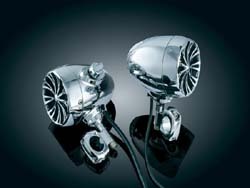 Perfect for anyone wanting the ultimate audio source solution for an HD fairing bike. Listen to your favorite FM radio stations adn MP3/MP4s, tell time and check temperature form on unit. Six radio station presets, home and away functions. USB port for thumb drive, easy to access volume controls and function buttons and an auxillary input to connect a separate music device. Powered USB port allow for MP3 playback via a thumb drive and also doubles as a charging system fo rmost any USB device. Wired for H-D controller integration and H-D fairing Radio Din Bezel that is form fitted fo rthe stock H-D fairing. 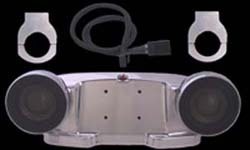 CS-DNR: This all-in-one amplified motorcycle speaker system will fit the Road King. It allows the rider to bring most any GPS, satellite radio, mp3 player, etc. along for the ride. Our specially designed mount cradles your device for secure integration (audio devices shown in photos not included). 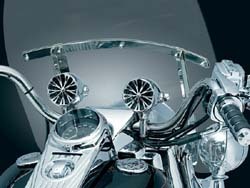 The Dock-N-Rock motorcycle audio system is precision machined out of solid billet aluminum and triple dipped in show chrome. 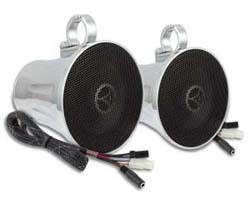 Our motorcycle speakers use a Kapton 1" voice coil and poly propylene alloy cone. Wait till you here the sound; You won’t be disappointed! Kit includes Dock 'N' Rock assembly with two 2.5" motorcycle speakers, wiring harness, and bar clamps already attached for easy installation. Just add your music player and you're ready to rock! Dimensions (height x length x depth): 3.25" x 9.75" x 3.125"
Media System: Lack of quality audio solutions for Road Kings getting you down? Our new RKS media systems are the next thing that should hit your windshield. Featuring 120 watts of pure power and nifty features that would make anyone smile, there is no doubt this system will keep you happy for miles to come. Utilizing industry standard line level inputs, the RKS can be driven by practically any media player, satellite receiver, or other portable audio devices. And with battery monitoring software on board, you'll be able to enjoy music and device charging on or off the road without worrying about your battery. 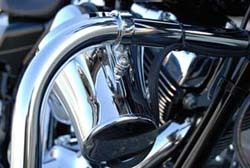 AL-240: Finally, a way to add bad boy lower speakers to your bike. 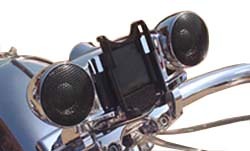 These new all-in-one 5-1/4 inch amplified speaker bullets with built in digital class D technology produce loud, crystal clear audio as well as look great on your bike. Installation is an ease with built in line level inputs which make the speakers easy to hook up to your OEM audio system or you can plug them directly into your music enabled phone, iPod or mp3 player. 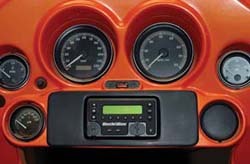 Kit includes all harware and wiring to complete installation for either a high level (stereo head unit) or low level (iPod, mp3 player, etc.) audio input. 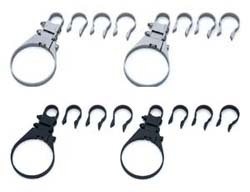 Sold in pairs - Includes standard size (1-1/4") p-clamps that fit most all engine guards. SP-33, SP-32, SP-51 Chrome or Black Speakers: This system ROCKS! New 2nd Generation looks, performs, & rocks even better! 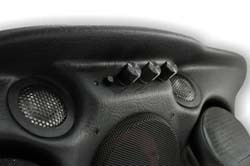 No compromise here with the perfectly designed 3" main speakers with additional tweeters for full bodied sound. 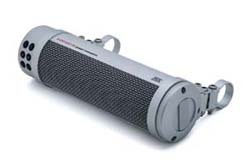 The weatherproof bullet housing has powerful built-in true 50 watt amplifier & includes a volume & on/off control switch. 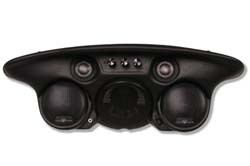 Convenient swivel adjustment gives you the freedom to position speakers in any direction you choose. With a full plug & play wiring harness, noise purifier & standard 3.5 mm jack, simply connect your iPod, MP3 player, satellite radio, personal CD player, etc, & ride on. 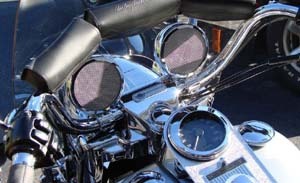 Road Radio: Add music to your Road King ride! The Road Radio comes with premium Pioneer electronics and 300-watt Kenwood 6.5" speakers. The RR-CD comes complete with radio and CD player. Have your own audio equipment? Then choose the RR-BX which is the case and installation kit only. Measures 17" wide x 7-1/2" tall x 3-3/4" deep. The Box bolts onto the stock windshield. Made out of rhino tuff automotive grade ABS plastic and is internally and externally suspended with a series of rubber shock mounts. Includes weather proof cover, hidden antenna, quick disconnect plug, 12 volt inline fuse and cigarette light adapter to plug in your accessories and stainless steel hardware. Available with or without pioneer unit & speakers. Installation is bolt-on easy and takes about an hour. Relocation kit included. 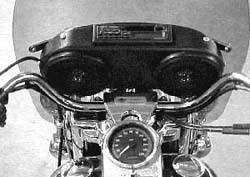 Road Radio made in U.S.A. Patent Pending Width 18", Height 7 1/2", Depth 3 3/4" (center). 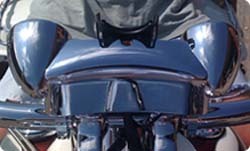 The Road Radio Box bolts onto the stock windshield of most Harley-Davidsons. 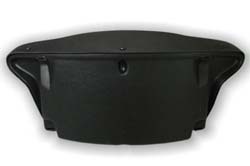 Made out of rhino tuff automotive grade ABS plastic and is internally and externally suspended with a series of rubber shock mounts. Includes weather proof cover, hidden antenna, quick disconnect plug and stainless steel hardware. 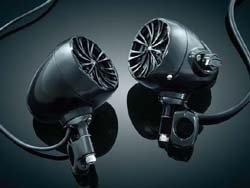 Available with or without Kenwood unit & speakers. Installation is bolt-on easy and takes about an hour. 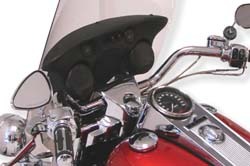 Speedometer or Tachometer may have to be relocated on Police models with handle bar mount. Relocation kit available. Built-in Front Auxiliary Input: The DEH-1900MP features a new built-in front AUX input, which can be easily connected with a wide range of external devices, such as digital audio players. Even plug in your IPod. Or your Inno™ and enjoy another way to listen to XM Satellite Radio. The auxiliary input now increases your enjoyment for music and selection. MP3 and WMA Playback: Don't let your favorite music downloads languish on your computer hard drive. Burn them to a CD-R or CD-RW and play them on the DEH-1900MP. Each disc you burn has the capacity to hold up to ten complete albums of MP3 music and twenty for WMA discs. Trust us, that's a lot of music. And since these CDs hold so much data, you'll be happy to know that Pioneer MP3 headunits also include a random play mode. You'll also be pleasantly surprised to find that our players support ID3 Tags and WMA text, which display artist, title, track and album information, just like your computer. Best of all, Pioneer's Digital Speedread2 CD mechanism provides incredibly fast performance. Card Remote: The DEH-1900MP comes with a card remote, allowing you to control key functions without taking your eyes off the road. It fits easily in your hand, and it's small enough to stash in your console when not in use.